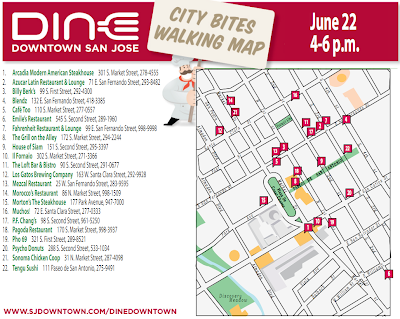 Today you can sample food from 22 different restaurants throughout Downtown! 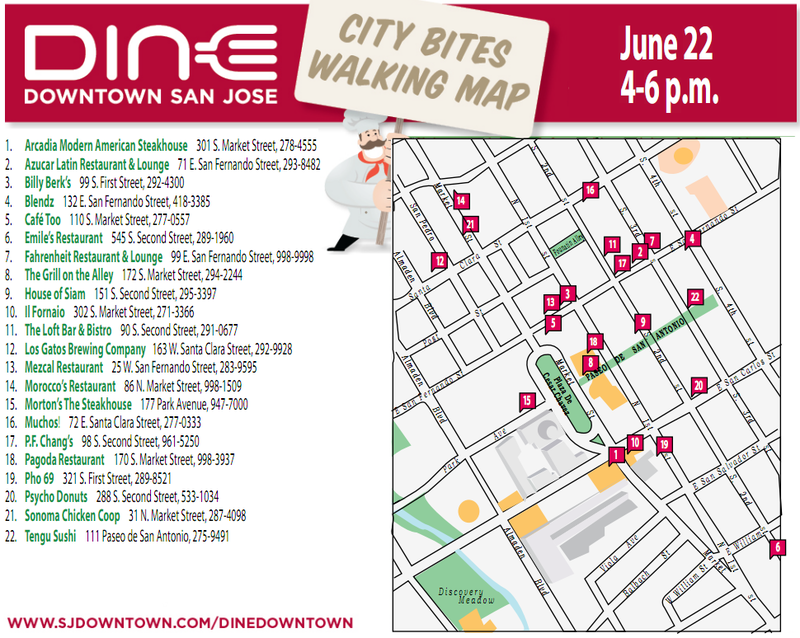 To help kickoff Dine Downtown (San Jose's Restaurant Week), most of the participating restaurants are giving people walking by a taste of their cuisine between 4 and 6pm. Below is the walking map for the event, just click to enlarge and print out. Interesting map...despite the City pouring millions into trying to make San Pedro Sq the "it" spot for dining it looks like San Fernando Street is our Restaurant Row. If that's the case, it's sorta sad that PF Changs is part of the "row." Sorry guys, I dropped the ball on this one. The event was actually Wednesday :/ I found out the hard way, but did get to enjoy the prix fixe meal at Fahrenheit. 19 Market, 71 St. Peter, Britannia Arms, SPS Wine Bar and Bistro, Morocco's and Chicken Coop are all participating. This map refers to strictly city bites, which is a one day only event. As far as the millions of dollars the City & RDA has allocated to us, the project is still under construction.I'm confident the next Dine Downtown will have close to 30 tenants participating. We are having a sneak peak September 10th if you would like to see how the project is progressing.